Tweet This is one of my favorite pics from Brenna's first Halloween when she was only 2 months old. I wasn't really sure what I wanted to dress her up as and let's face it, as a mom of a 2 month old, I didn't really have my act together yet. At the last minute I came up with this DIY, no-sew infant cow costume. All you have to do is cut irregular shaped patches out of your sticky-backed felt and plop them on a onsie. Then string a little cowbell through a piece of ribbon and you're done. Moo. 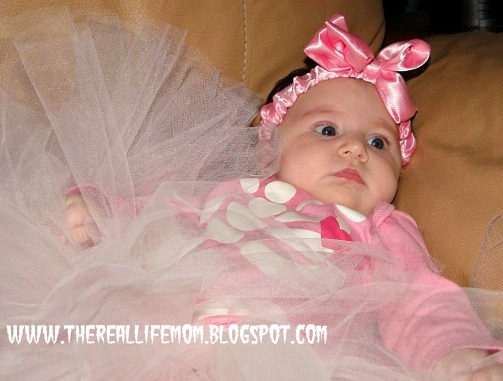 Here's another cute DIY Infant costume from my pal Michelle of The Real Life Mom. Her skeleton/ballerina is so cute! She also did a post recently on How to Make your Own Fairy Wings! Check it out! Looking for fun family themed Halloween Costumes, be sure to check out this post! I love to share at the following Link Parties!! Love! Such a cute and easy idea. Which easy is the key word with anyone with a tiny baby! I love how creative you are Jenn. You inspire me to try new things! Thanks for sharing. Oh that is so adorable. And I love how simple it is! I bet you could customize it with the sticky felt and make tons of cute costumes! Thanks for sharing! Oh my goodness! Not only is that picture just adorable, or the costume- but your daughter! Oh my- she's so cute!! Hi! Such a cute and easy idea! Stopping by from Wandering Wednesday. I hope you'll stop by soon! Moo? I actually laughed at that! I may have just been giddy at how scrumptious that baby is, and for a new mommy, you had your crafting thing down pat. I love the bell-nice touch! Submit it in my Handmade Halloween Costume Contest starting today - October 15th. Thanks for the link Jenn! I love your new post on themed Halloween costumes! Great post! Hey Jenn, I totally missed commenting on this like a month ago, :( sorry. Saw it, just didn't comment. Very cute, and easy, and commfy, which is what every baby needs their first halloween. I'm linking this up to my last party **6 weeks 2 SPook**, I just want all things that are halloween, there, hope you dont mind. It will be safe for next year, lol. Thanks again, for linking up! I am looking for the infant costumes having cheap prices, But the costumes should look fantastic.